Remember those whatchamacallit flowers I found growing at a CASTLE ON A RAINY DAY ? 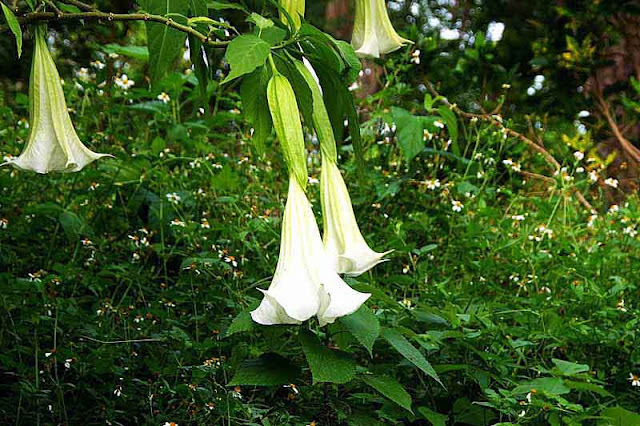 Well, I researched, with some assistance from Mrs RyukyuMike, and came to the conclusion they are Angel's Trumpets and they probably came here from somewhere in South America. 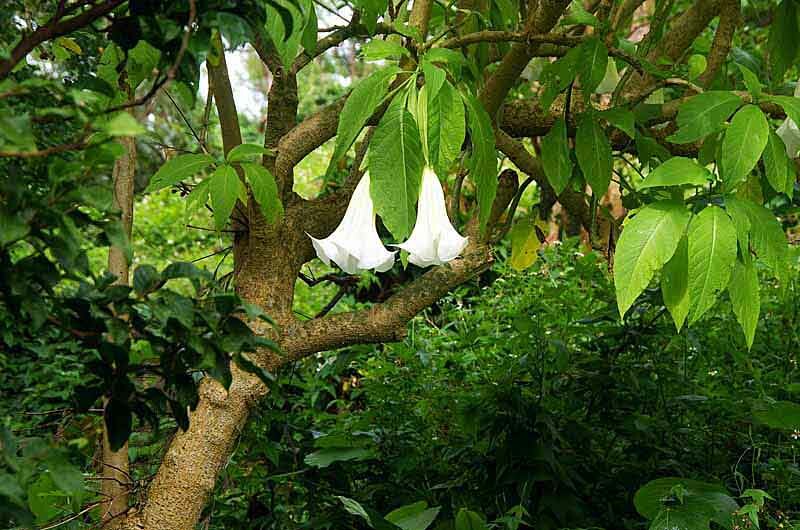 These flowers don't just come in white. There's other colors like pink, or orange and maybe, some other colors in between. So, now that I sort of know the name of them, I'll see what other kinds I can find to shoot photos of for you. I just won't even attempt making up a scientific name until someone who really knows flowers, comes along and gives me the straight scoop. HowStuffWorks shows a photo of these Angel's Trumpets and they look like mine, sort of. But, they say the plant grows 3 to 5 feet tall and you can find blue and red flowering plants, too. WIKIPEDIA says the trees could grow from 3-11 meters tall and has lots of photos showing different flowers. None of the flowers look exactly red or blue, to me but, maybe some are peach-colored. There are probably some hybrid plants floating around. And, they could even have somebody injecting different colors into these plants to make the flowers turn red and blue. Who knows. It's hard to decide who to believe, when it's Wiki vs HowStuffWorks. I'm not sure which one is the best source. So, I'll just give you the links and let you decide. Does anyone really know the scientific name for these Angel's Trumpets that I took photos of in Okinawa, Japan ? Thank you. I hope to see you soon on the Facebook Fan thingy !